The outdoor living market, spurred by homeowners’ desire to extend the comfort of their living and entertaining areas outdoors to decks and patios, is showing no signs of slowing down. As a result, the closely aligned deck and railing markets continue to skyrocket. With this growth comes new innovations in materials and assembly methods. Aluminum railings—powder-coated aluminum railings, in particular—have been gaining in market share due to their aesthetics, durability, low maintenance and varied design and color options. However, one of the main challenges related to any aluminum railing project is finding a product that is engineered for both commercial and residential use, locally available and easy to install. 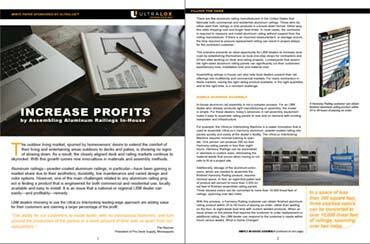 It is an issue that a national or regional LBM dealer can easily—and profitably—remedy.